You can create invoices for purchase orders, individual line items, and blanket purchases. You can also link existing invoices to purchase order. You can invoice items before you receive the items if desired. You can also reopen closed invoices, and you can print all invoices. 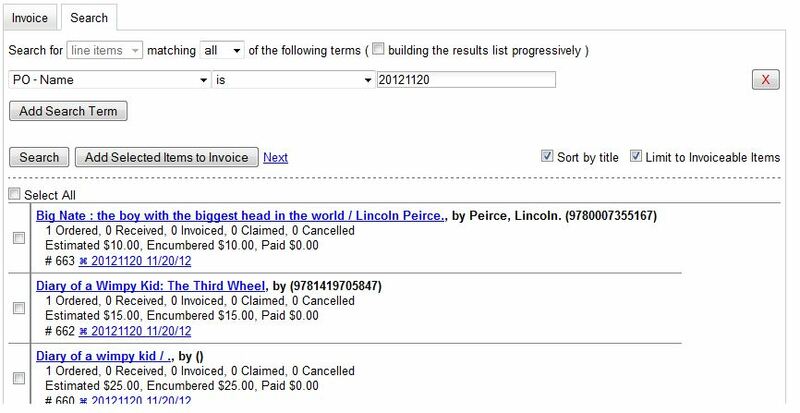 You can add specific line items to an invoice from the PO or acquisitions search results screen. You can also search for relevant line items from within the invoice interface. In addition, you can add all line items from an entire Purchase order to an invoice or you can create a blanket invoice for items that are not attached to a purchase order. You can create a blanket invoice for purchases that are not attached to a purchase order. Click Acquisitions → Create invoice. Enter the invoice information in the top half of the screen. To add charges for materials not attached to a purchase order, click Add Charge… This functionality may also be used to add shipping, tax, and other fees. Select a charge type from the drop-down menu. New charge types can be added via Admin → Server Administration → Acquisitions → Invoice Item Type. Select a fund from the drop-down menu. Enter a Title/Description of the resource. Enter the amount that you were billed. Enter the amount that you paid. You can create an invoice or add line items to an invoice directly from a Purchase Order or an acquisitions search results screen. Place a checkmark in the box for selected line items from the Purchase Order' or acquisitions search results page. If you are creating a new invoice, click Actions → Create Invoice From Selected Line Items. Enter the invoice information in the top half of the screen. If you are adding the line items to an existing invoice, click Actions → Link Selected Line Items to Invoice. Enter the Invoice # and Provider and then click the Link button. 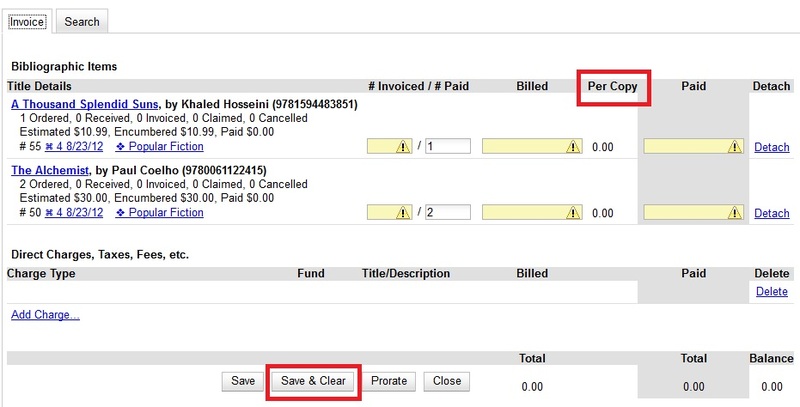 Evergreen automatically enters the number of items that was ordered in the # Invoiced and # Paid fields. Adjust these quantities as needed. Enter the amount that the organization was billed. This entry will automatically propagate to the Paid field. You have the option to add charge types if applicable. Charge types are additional charges that can be selected from the drop-down menu. Common charge types include taxes and handling fees. You have four options for saving an invoice. Click Save to save the changes you have made while staying in the current invoice. Click Save & Clear to save the changes you have made and to replace the current invoice with a new invoice so that you can continue invoicing items. Click Prorate to save the invoice and prorate any additional charges, such as taxes, across funds, if multiple funds have been used to pay the invoice. Prorating will only be applied to charge types that have the Prorate? flag set to true. This setting can be adjusted via Admin → Server Administration → Acquisitions → Invoice Item Type. Click Close. Choose this option when you have completed the invoice. This option will also save any changes that have been made. You can re-open a closed invoice by clicking the link, Re-open invoice. This link appears at the bottom of a closed invoice. You can open an invoice, search for line items from the invoice, and add your search results to a new or existing invoice. This feature is especially useful when you want to populate an invoice with line items from multiple purchase orders. An invoice summary appears at the top of the invoice and includes the number of line items on the invoice and the expected cost of the items. This number will change as we add line items to the invoice. Enter the invoice details (optional). If you do not enter the invoice details, then Evergreen will populate the Provider and Receiver fields with information from the line items. If you do not want to display the details, click Hide Details. Click the Search tab to add line items to an invoice. Select your search criteria from the drop-down menu. On the right side of the screen, Limit to Invoiceable Items is checked by default. Invoiceable items are those that are on order, have not been cancelled, and have not yet been invoiced. Evergreen also filters out items that have already been added to an invoice. Finally, if this box is checked, and if your entered the invoice details at the top of the screen, then Evergreen will filter your search for items that have the same provider as the one that you entered. If you have not entered the invoice details, then Evergreen removes this limit. Sort by title (optional). By default, results are listed by line item number. Check this box to sort by ascending title. Building the results list progressively (optional). By default, new search results will replace previous results on the screen. Check this box for the search results list to build with each subsequent search. 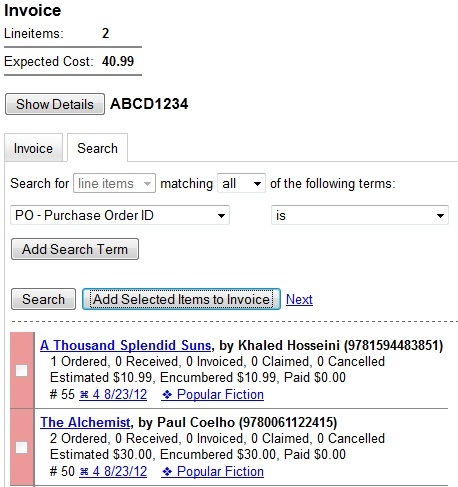 This option is useful for libraries that might search for line items by scanning an ISBN. Several ISBNs can be scanned and then the entire result set can be selected and moved to the invoice in a batch. Use the Next button to page through results, or select a line item(s), and click Add Selected Items to Invoice. .The rows that you selected are highlighted, and the invoice summary at the top of the screen updates. Click the Invoice tab to see the updated invoice. Enter the amount that the organization was billed. This entry will automatically propagate to the Paid field. The Per Copy field calculates the cost of each copy by dividing the amount that was billed by the number of copies for which the library paid. You can create an invoice for all of the line items on a purchase order. With the exception of fields with drop-down menus, no limitations on the data that you enter exist. Enter a Vendor Invoice ID. This number may be listed on the paper invoice sent from your vendor. Choose a Receive Method from the drop-down menu. The system will default to Paper. The Provider is generated from the purchase order and is entered by default. Select a payment method from the drop-down menu (optional). The Invoice Date is entered by default as the date that you create the invoice. You can change the date by clicking in the field. A calendar drops down. Enter an Invoice Type (optional). The Shipper defaults to the provider that was entered in the purchase order. Enter a Payment Authorization (optional). The Receiver defaults to the branch at which your workstation is registered. You can change the receiver by selecting an org unit from the drop-down menu. The bibliographic line items are listed in the next section of the invoice. Along with the title and author of the line items is a summary of copies ordered, received, invoiced, claimed, and cancelled. You can also view the amounts estimated, encumbered, and paid for each line item. Finally, each line item has a line item ID and links to the selection list (if used) and the purchase order. You can use the link invoice feature to link an existing invoice to a purchase order. For example, an invoice is received for a shipment with items on purchase order #1 and purchase order #2. When the invoice arrives, purchase order #1 is retrieved, and the invoice is created. To receive the items on purchase order #2, simply link the invoice to the purchase order. You do not need to recreate it. Enter the Invoice # and the Provider of the invoice to which you wish to link.